The Black Major was the second-in-command of Palitoy's Red Shadows organization. 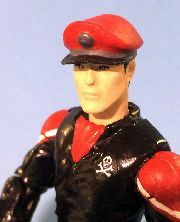 A former Action Force member, he became a Red Shadows operative after being brainwashed by Baron Ironblood. Or by defecting of his own free will in the early 80's comic Battle Action Force continuity, if you prefer that continuity. 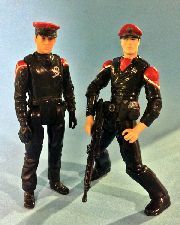 The Palitoy Black Major figure was a head-to-toe repaint of the Action Force Commander (AFC) figure, with both figures having black hair. Because I had already made an AFC custom, I used no overlap parts on Black Major to make them appear as different from each other as possible. 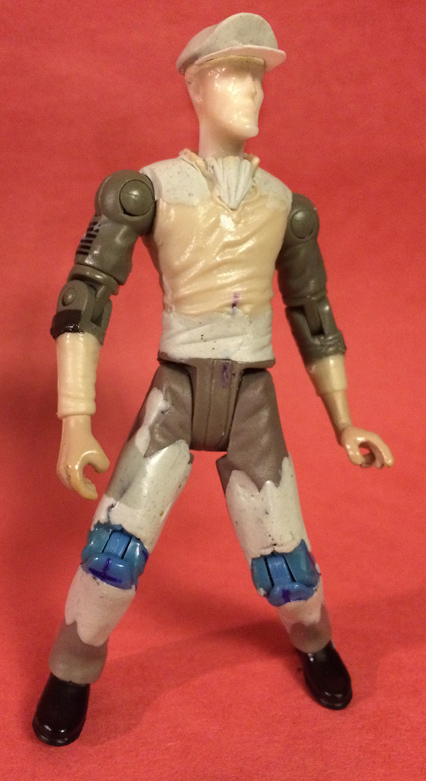 The parts used, mostly Star Wars, create a uniform that is different than that of my AFC custom. The pushed-up sleeves show a bit of forearm, distancing their appearances even more. I also did away with Black Major's gloves (a half-step removed from the Iron Grenadiers, who also love the black/red uniforms) and added an additional Red Shadows logo in between the shoulder blades. The Lobot legs work well, as Lobot is one of the few SW figures not wearing tall boots. Lando (in Bespin casual) and the Admiral Ackbar and other Mon Calamari. Other than those brave souls, or soles, the Star Wars universe is all about tall boots. Based on the Palitoy figure, plus some gunmetal grey bits. The cap badge should probably be gold, as the Black Major is a major, but gold with black and red would look too much like an Iron Grenadiers uniform. So it's gunmetal grey instead. 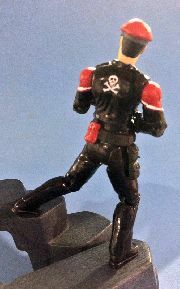 The extra pouch near the small of the back is red to balance out the ascot on the front of the figure. The chest/back Red Shadow logos are printouts on regular paper, coated on both sides with several layers of clear coat. The head is cast. The peaked cap is sculpted of epoxy and tape, with the bill made of paper. The bill was added after the face painting was done. The cap badge is cut from the scope of a ROC New-Viper rifle. 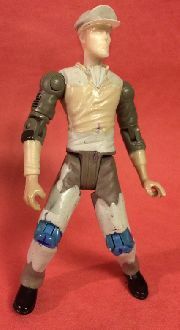 The upper body of the Han Solo body was joined to the lower body of Lobot, with additional mass build around the "spine" of the Han Solo chest/back. The Baroness gunbelt didn't quite fit, so a ROC Ice Viper pouch was added. The knees were removed from the Cobra Commander legs and swapped in to replace the static Lobot ones. Yes, I added articulation for a change. 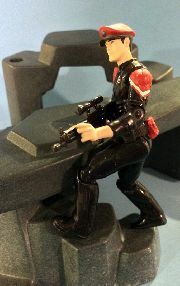 The figure keeps the same "low center of gravity while shooting" squat as its neutral position, but can also have a decent "front step kick" stance, or even the always impressive "sitting in a chair" pose. The limited stances for this particular character don't fit the figure. 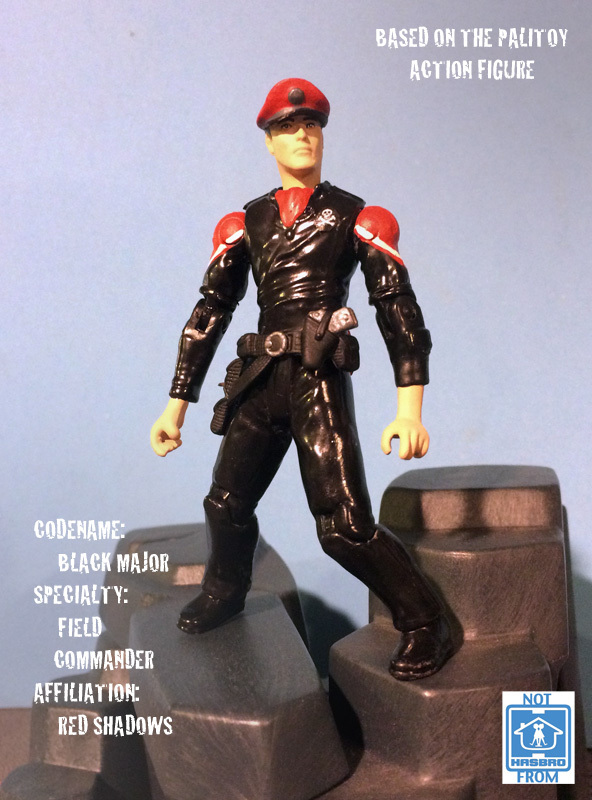 As a "pretty important" character, Black Major should be able to stand upright. At some point, I'll rework the figure from the waist down and add to the gallery as the .5 version.